Not a lot gets done at these boys’-club excursions, in part because of the calendar. The free-agent market is barely a week old, no one’s finalized his forty-man roster, and the needs of each team won’t fully manifest until the frenzy of Winter Meetings one month hence. Those events, held in mid-December at another Kubla Khan luxe re-sort, are a Ford Bronco chase of trades and desperation, capitalism on a four-day crack toot. Still, you know: it never hurts to talk. “We were walking down the hall when either Hill or I broached the subject of Stanton,” Cashman says. Giancarlo Stanton was the circus-strongman slugger who’d pummeled the National League for eight years. Fresh off a fifty-nine-homerun season and a Most Valuable Player Award in 2017, he was a wild extravagance on the now-threadbare Marlins, a Ferrari at a drive-in showing The Florida Project. 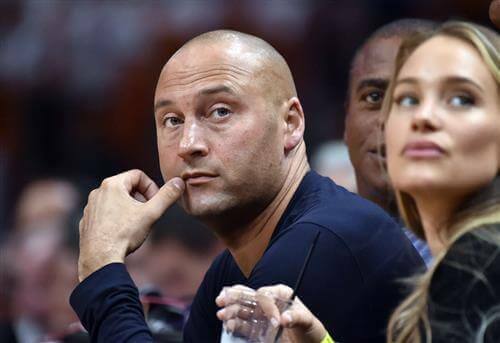 The Marlins franchise (and its many hundreds of millions in debt) had been sold months before, for $1.2 billion, to a baggy-suited rich guy by the name of Bruce Sherman and his new partner, Derek Jeter. Of the several entities that pursued the Marlins (among them, a consortium headed by Jeb Bush and another by Jared Kushner’s father, Charles), the Sherman-Jeter group seemed the least provisioned to ride out years of heavy losses. Sherman had walked away from Private Capital Management, his wealth management firm, after a string of big bets blew up in his face. Among them were sunk positions in Bear Stearns, the Great Crash failure, and newspaper chains like Knight Ridder and Gannett that chunked off billions of dollars in high-speed losses. Over four years’ time, PCM’s portfolio shrank by 90 percent. To be sure, Sherman owned a $70 million yacht, which he had humbly christened The Majestic, and he’d deftly repotted himself in old-growth Naples, where he chaired a wine festival every winter. But in team-owner waters, he was plankton to sharks, a multimillionaire in a billionaire boys’ club.